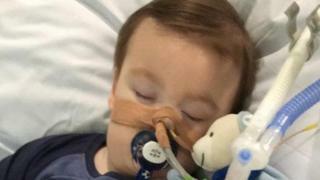 The Pope has tweeted his support for sick toddler Alfie Evans whose parents lost a legal fight to stop his life support machine being switched off. Pope Francis said he hoped "everything may be done to continue compassionately accompanying little Alfie Evans". Last month the European Court of Human Rights (ECHR) rejected the case of his parents Tom Evans and Kate James. The Merseyside couple wanted to take the 22-month-old to Rome for treatment. Pope Francis said he hoped the "deep suffering" of Alfie's parents would be heard, adding: "I am praying for Alfie, for his family and for all who are involved." Alfie's parents had taken their fight to keep him alive to the Supreme Court last month but judges upheld an original High Court ruling that he should only receive palliative care. The toddler is in a "semi-vegetative state" in the Alder Hey Children's Hospital in Liverpool. He has a rare degenerative neurological condition that has not been definitively diagnosed by doctors. His parents from Liverpool wanted to explore further treatment options, hoping that specialists at the Bambino Gesu Paediatric Hospital - which has links to the Vatican - would be able to pinpoint what is wrong with Alfie. The Pope expressed support last year for another British child when he tweeted his support for the parents of Charlie Gard, whose family lost a similar legal case against Great Ormond Street Hospital in London.